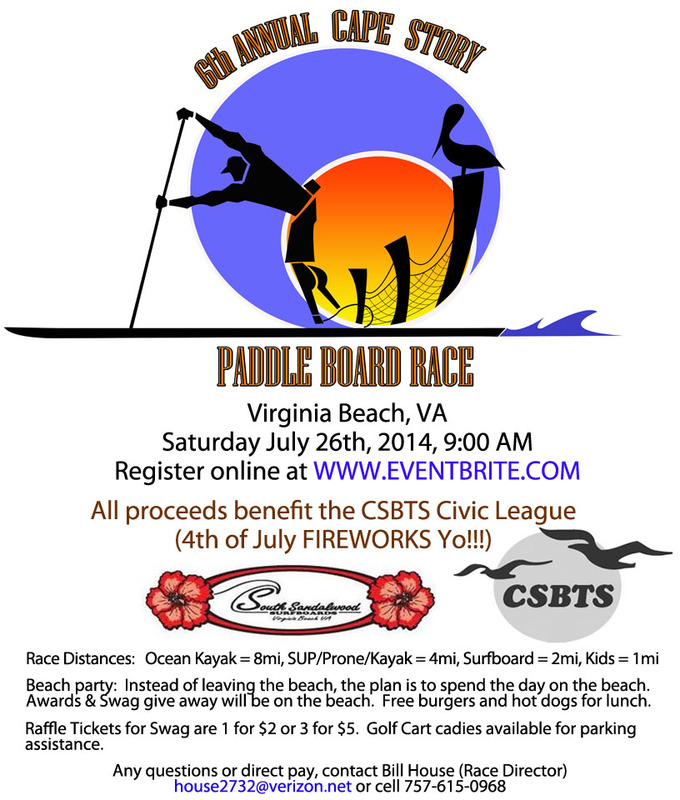 6th Annual Cape Story/South Sandalwood Paddle Board Race. July 26th Race time 9:00 AM. Register online www.eventbrite.com $40 by 21JUL14(Includes entry fee, t shirt, 2 raffle tickets and feastivities) or at 8 AM day off for $50 (Tshirt not guaranteed day off). All proceeds go to CSBTS Civic League Fireworks and Team River Runner. Races Surf Ski-8 MI M&W – 14′ SUP-Open/ 12-6 SUP M&W / SUP Surf -4 Mi M&W / Displacment Prone-4 MI-OPEN / Surfboard Prone 2 MI OPEN/ and Kayak Open top, tandam & others 1 group – 4 MI-Open; 1 group- Kids 1 MI 1 group. Trophies for 1st, 2nd and 3rd. Awards and Beach Party on the Beach. Let’s enjoy the day. Free hamburgers and Hot Dogs. BYO Drink. Raffle Tickets 1 for $2 or 3 for $5. $10 Surfboard Raffle Tickets…Board donated by South Sandalwood Surfboards. Golf Carts cadies available for parking assistance. Any questions Contact Bill House Race Director – house2732@verizon.net or 757 615 0968.